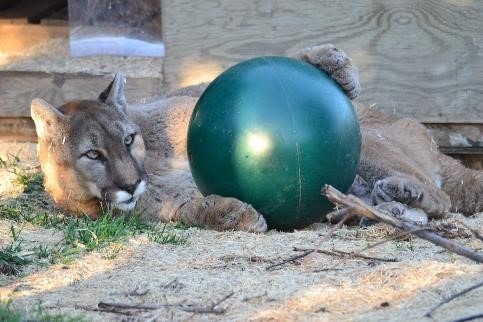 Just a week before his 18th birthday, the Sanctuary said good-bye to Spring the cougar. He had been receiving special care for a number of years, but his last days still came too quickly. You’ve heard the phrase “Gentle Giant” and that truly describes Spring the cougar. 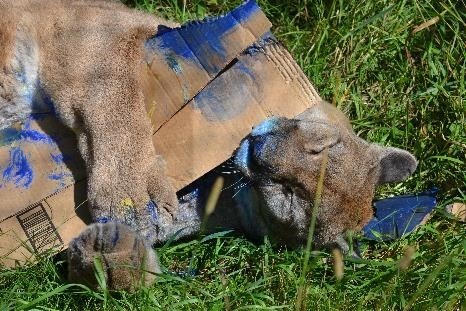 He was the largest cougar at the Sanctuary and had the sweetest demeanor. Spring even preferred to live alongside bobcats, because he was intimidated by other cougars and big cats. He loved people, painting and he loved playing with his toy balls. For a big and senior boy, he had a young soul and enjoyed every moment to the fullest. And his joy was contagious to those that cared for and loved him. We know you felt it, too. Spring’s distinctive call, which sounded like “wow,” could be heard throughout the Sanctuary. He never missed an opportunity to say hello, followed by his rumbling purr. And his distinctive expression, including crossed-eyes, made it easy for everyone to know it was Spring the moment they saw him. Spring was diagnosed with severe spondylosis and arthritis in 2011 and early renal disease. He received pain management and kidney support orally several times a day. Because of his arthritis, he could not groom very well but enjoyed being brushed/scratched through the fence and would position himself along the fence each time a caretaker approached with the back scratcher. He was the only cat who had both a summer and winter home at the Sanctuary. He loved to nap in the shade of the pine trees in the summer, but the cold was hard on his arthritis. So come fall, he would move into the quarantine area of the Sanctuary where he received an indoor room with his very own hammock. He and his neighbor Salem, one of the smallest bobcats on the property who is 21, would compete with who could mark the shared wall the most. It became a big clean up job for the caretakers, but they were happy to support their antics. It’s the small things we notice that alerts us of a big change. Even though Spring still talked to us and purred nonstop, he started letting Salem win the marking contest. The last week, there was less cleanup for the caretakers and he spent more time on his hammock and we knew his health and heart were declining. The day we said good-bye, the staff held a bedside vigil. He was peacefully sedated while lying on his hammock before being brought into the Scarlet Veterinary Center. Each staff member had the opportunity to personally say good-bye. We all circled around him as tears flowed down our faces. Our veterinarian asked if we were ready, if Spring was ready. We said yes, even though our hearts wish we didn’t have to make that decision. But, before she could administer the last drug, Spring took his last breath on his own, something we did not expect. It was a moving moment, and reaffirmed we had picked the right time. As with all goodbyes, we do not take the decision lightly. Often, we question – are we deciding too soon? Spring assured us we had not. And, it’s important to remember, if we choose a day too soon to ensure they do not suffer, they will forgive us. But, if we choose too late, we will never forgive ourselves. Spring, thank you for all the joy you brought everyone. You are truly one-of-a kind. May there be many bobcat friends and toy balls where you roam free now. Spring, a male cougar, spent 9 years in a wire cage. As he was closely bonded to the only humans he knew, Spring did not know he was a cougar. He had a difficult adjustment after his owners chose to surrender him in 2007. TWS provided all the love and care we could but we were unfamiliar faces to Spring. He refused to eat his first week at the sanctuary. 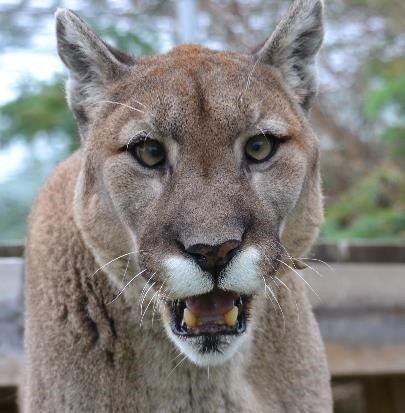 Spring was very fearful and confused when we introduced him to the other cougars. He just wanted to run and hide. Fortunately, with time, Spring has come out of his shell and is now very social to his keepers. As a result of his solitary start to life, Spring still has trouble with other cougars and so lives alone, but he does not seem to mind at all. Spring has a very calm spirit, a unique chirp, and a sweet face. He loves to playfully stalk his keepers and unsuspecting interns, as well as chat with them in his own native cougar tongue. You can help provide daily care for Spring by sponsoring him today. Your support is greatly appreciated.